3D Illusion Lamp - the lamp itself is Flat Unique Lighting Effects Amazing Optical Visual Illusion Home Décor Lamp. Press the touch button to last color, then press it again, auto color changing mode works. Long touch the smart sensor switch to TURN OFF. The statue is NOT 3 dimensional. It's actually a flat plate carved into the meditation stance. If you use a cell phone camera to see this light, 3D effect is the best. Buy Your 3-D Night Lamp Today! 【ENERGY SAVING】：Durable base in which there are 9 LED beads, powered by 5V USB Cable connected to PC or your home adaptor,this make it more energe saving. 【TWO MODES】:[First Mode: get the exact color you want, by taping the smart touch switch one by one] + [Second Mode: 7 Kinds of colors flash circularly themselves].Creative lamp makes the perfect as a festival, birthday gift for kids. Best gift for your kids, friends, relatives or your lovers. 【VISUAL】:Because it been scratched ALL over the lamp itself, so it looks like 3D. 3D visual martian creative lamp is an innovative artistic atmosphere light, optical acrylic light guide plate engraving a variety of 2D graphics, 3D visual impact. 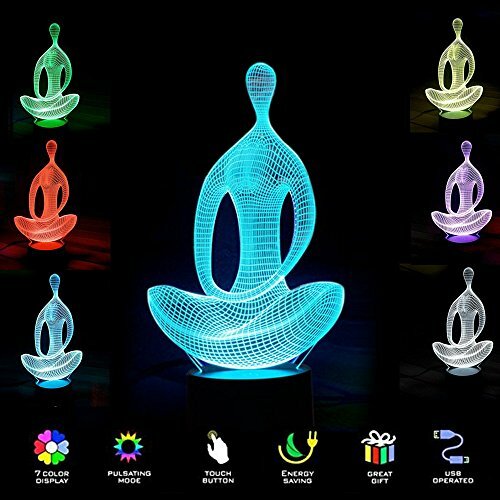 Unique lighting effects amazing optical visual illusion home decor lamp, It makes your room more interesting. 【USB POWER PORT】: compatible with any USB power port, such as Laptop, Computer, USB Power Bank, USB Power Adapter, and any other with USB Connector. Safe to touch, doesn't overheat. 【APPLICABLE SCENARIOS】: bedroom, baby room, bars, cafes, hotels, cinema, clubs, university, restaurant atmosphere light, Christmas gifts, birthday gifts, advertising promotional gifts, holiday gifts, tourist attractions gifts. If you have any questions about this product by LJNH, contact us by completing and submitting the form below. If you are looking for a specif part number, please include it with your message.